Here’s a nice video giving a little look into maple syrup production, plus a visit to Amish baker Emma Miller’s bakery for a baking demo and interview. Host Robin Benzle comes to us from Burton, Ohio, which is in the Geauga County Amish settlement in northeastern Ohio. Last week we had a look at the goods on display in Miller’s Bakery in Holmes County, Ohio. 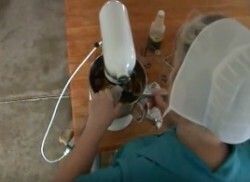 This video shows more of the process of creating sweet treats. Emma is a nice interview subject with a friendly and warm personality. I don’t know about you, but I could go for one of those rolls. I see they use batteries and an inverter to run the mixer. How do they charge the battery? In South Central Pa. some use solar panels while others us gasoline powered generators. Many orders use car batteries to power the LED lights on buggies when on the highway. Older orders (Nebraska) still use blue kerosene lanterns to tag their buggies. Those look sooo good! My mouth is still watering! I will definitely be visiting this place if I ever get there! Agreed. Maple syrup is yummy. I found it interesting to learn that maple syrup is only made in North America. I have a nice memory of collecting maple sap with Amish friends in PA. It was a bit tricky as most of the trees were growing on a steep river bank, almost like the side of a ravine. But we managed to collect many gallons. The lady at the beginning makes a point on real maple syrup. There is quite a taste and texture difference between the thicker artificial stuff and the thinner real stuff. However I’m partial to both on my pancakes. Pancakes. It’s been awhile since I’ve enjoyed a stack of those come to think of it. Maybe I’ll remedy that tomorrow morning. Oh wow! I so much want one of those cookies and ESPECIALLY that Maple Cinnamon Roll! I wish Emma would ship them west to California!!!!! I’d pay for the shipping! YUM!